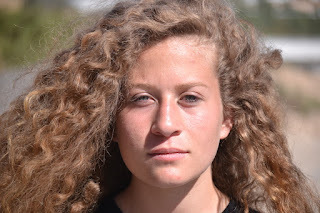 Ahed Tamimi (2001) is a Palestinian teenager, living in the Israeli occupied West Bank. She gained worldwide notoriety because she screamed at, punched, slapped and kicked at an Israeli soldier. Her mother streamed the confrontation live on Facebook. The officer faced her impassively, absorbing some blows, evading others, but never striking back at her, then finally turned and, with his comrade, simply walked away. Quelle humiliation. Ahed Tamimi's actions got her swiftly jailed without bail. Ahed Tamimi was eventually sentenced in a military court to eight months in prison. Ahed Tamimi, 17, accepted a plea bargain that will end her trial, her lawyer said. The sentence included a fine of about $1,400 and a three-year suspended sentence. Ahed’s mother, Nariman Tamimi, who was charged with incitement for showing the altercation live on Facebook, was also sentenced to eight months in prison, a suspended sentence and a fine of about $1,700. Mother and daughter were released on July 28, 2018. As a result, a majority of Palestinians view the blue-eyed teenager as a hero of the Palestinian cause. However, some Palestinians wonder if the actions of Ahem Tamini might even be counterproductive, because the soldiers behaved with restraint and thus showing that Israelis 'are human' after all. I wonder why young Palestinian women choose inept violence to counter the Israeli occupation. In my view it would be far wiser to get a proper education, to learn a trade and to work your way out of despair and poverty. And using your child to get publicity in a never-ending struggle is always a reprehensible strategy. Update [29 July 2018]: After her release Ahed Tamimi was quoted as saying that she had resolved "to study law and to focus on holding the occupation accountable". It seems that a few months in an Iraeli prison, away from her abusive parents, finally managed to put some common sense in Ahed Tamimi.